AIR4CE is a stunt kite demo team that is exclusively flying quad line kites (hence the 4 in the name). It is the only team of this kind in the Netherlands and consists of Marc van der Graaf, Alard van den Bos, Remco de Beijer ,Mark Maier and Kristof van Ginhoven. demonstrations at kite-festivals and other events all across Europe. Quad line stunt kites exist since the late 1980’s but they still are a rare species of kites. from the ground or obstacles, or from other kites. In team flying the above aeronautical capabilities of quad line flight are used extensively. This allows coordinated moves that are unlike any other team flying in the kite world, and absolutely amazing to watch. Not only can the kites fly extremely close to each other but their ability to stop and pivot in mid-air, and the full control of the kite’s speed at any time allow unequalled precision in flight. 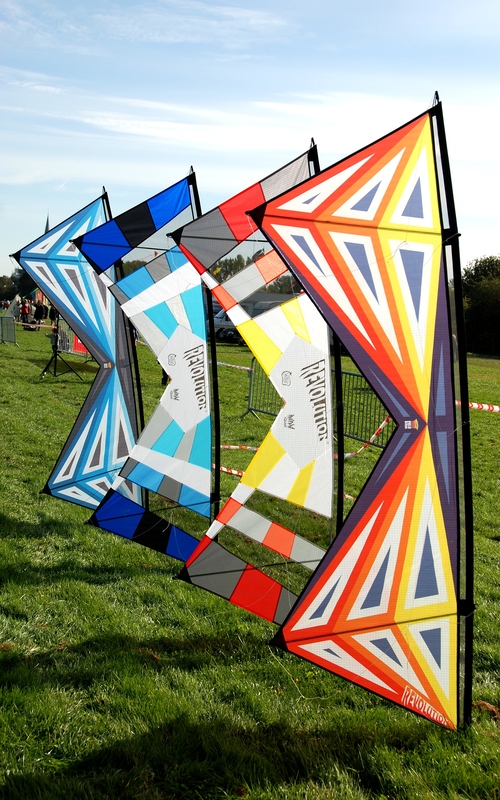 Depending on the wind conditions, AIR4CE use various designs of ‘Revolution’ type quad line kites. Those kites can fly from 1 Bft to up to 6 Bft, some specially designed versions even go up to 8 Bft.